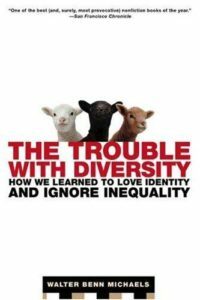 Michael’s 2006 book The Trouble With Diversity landed quite a few jabs at the politics underlying “multiculturalism” and “diversity” initiatives. In short, his argument is that “diversity” is really a cultural project that is fundamentally about depoliticizing economic issues. This project is waged mostly by center-right liberals (who present themselves as the political “left”), but is endorsed in most respects by the reactionary right as well. Michaels’ complaint, therefore, is primarily that diversity initiatives are used to silence the political left, in a era in which the concept of genetic “races” has been scientifically disproved and — let us not forget — in the post-Soviet era of the so-called “end of history” in which the actual political left is supposedly defeated and irrelevant. Michaels took much criticism (and praise too) for this book, which angered what he later came to term the “neoliberal left” — in reference to those who are part of the neoliberal center-right conservative block but don’t realize it (others call them “progressive neoliberals” or the “pseudo-left”). The book is aimed at a general audience. As such, Michaels mostly argues through analogy and example — Frantz Fanon‘s Black Skin, White Masks is a reasonable reference point. He often explains basic/elementary concepts at length, and moves quickly through the statistics and science that support his major premises. Though his tone is cynical and somewhat condescending, the thing is it is hard to disagree with most of his points. I, for one, was convinced by his argument against reparations. I had long supported reparations, but Michaels has convinced me that reparations are basically reactionary as being mere restitution in a situation where more far-reaching solutions are needed — my only (entirely petty) complaint being that he could have illustrated his point better with reference the seventh season episode of The Simpsons “Raging Abe Simpson and His Grumbling Grandson in ‘The Curse of the Flying Hellfish,'” in which artwork stolen during WWII is returned to an arrogant and smug German aristocrat who is completely unsympathetic in the context of restitution. While Michaels succeeds in destroying the depoliticized strategies of the neoliberals (what others refer to as “university discourse”), critics are right to point out that he doesn’t suggest much in the way of alternatives. At least, his consistently negative tone might be off-putting to some, because he never arrives at a negation of his negation. For those readers, I heartily suggest reading Alain Badiou‘s (with Nicolas Truong) In Praise of Love [Elogie de l’amour]. Badiou explains in more positive terms what a society premised on universalist difference rather than identity would promote. Another useful supplement (and corrective) to The Trouble With Diversity is Domenico Losurdo‘s Liberalism: A Counter-History, and its companion volume War and Revolution: Rethinking the Twentieth Century (and perhaps Giorgio Agamben‘s Homo Sacer: Sovereign Power and Bare Life). While Michaels essentially argues that liberals are hypocritical, Losurdo elaborates on this point further, concluding that Liberalism has always been a politics of exclusion. Liberals (including the currently hegemonic neoliberal order) simply engage in tactical debates over where the line of exclusion is drawn. Michaels and Losurdo seem to be in agreement, but Losurdo’s highly academic book naturally offers a much deeper and theoretical argument than is in found in Michaels’ mass-market book. Michaels has actually given some interesting interviews since the book was first published that are well worth reading. The include “Walter Benn Michaels on How Liberals Still Love Diversity and Ignore Inequality” and “Let Them Eat Diversity.” He has responded to his critics and stood his ground. Adolph Reed, Jr. has helped Michaels carry these sorts of arguments too, and Reed’s various writings and interviews are also worth investigating for the curious. My only lasting complaint about Michaels’ book is that his politics seem confused. He describes himself as a socialist, yet he explicitly makes the effort to state his disagreement with some very foundational principles of the “communism hypothesis”, like equality of outcome. In a way, he may claim to be a socialist critiquing neoliberalism from outside it, but he still seems to occasionally rely on liberalism to make his arguments. If the book spent more time explaining better alternatives to neoliberal “diversity” initiatives perhaps this confusion could have been resolved. He also takes a very reductionist view of “class”, giving short shrift to theories about social hierarchies that take into account multiple forms of “capital”, like those of Pierre Bourdieu. I do wish Michaels would write a sequel book, taking on things like “implicit bias” and other tactics of neoliberalism to individualize the structural/institutional problems of exploitation and reinforce market-based frameworks in the corporate world, the judicial system, and elsewhere. Though perhaps someone else has already written that book. Even though The Trouble With Diversity was published more than a decade ago, it seems as relevant as ever — many have noted how Michaels’ argument explains much about the rise of Donald Trump as a politician and the mass support for a social democratic opposition candidate like Bernie Sanders in the 2016 U.S. Presidential election.